In my recent giveaway I asked people to fill in some survey questions to get extra entries. I'm going to share results over the next few posts. First up is what is every one's favourite finish. Now, I'm not sure if people were just saying holos in a hope that it would make a difference in winning my giveaway, but holographic finishes are a very clear favourite with 45% of us preferring a holo finish to any other. 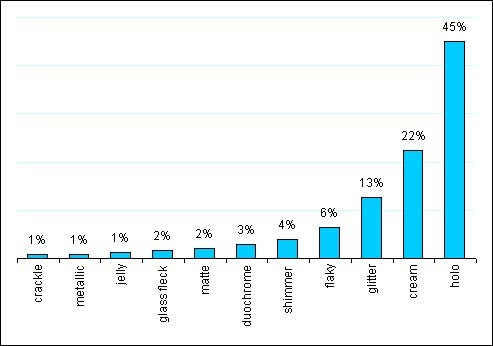 I was a little surprise to see cream finishes the next most popular. A note about the data, if you listed more than one favourite, I took your first one listed. Interesting isn't it, where do you fit in? And just for the record, my favourite is holo too!! And now, a pretty holo swatch. Do you know which one it is? Check back tomorrow to see. I prefer flakey, but didn't stop me shoving my fingers in front of friends with my nfu oh 62 on and going "LOOK AT THE COLOURS!!!!" I love holos, but I can't go past a lovely creme. Classic. I love holos!!! Im on a no-buy period unless its holographic! I think holos are amazing and agree with the results, though I think duochromes need to be a lot further up the ladder! I think the polish is Nfu Oh 61 or Gosh Holographic. This time it was Gosh holographic. I can't wait for the sun to be out to get a comparison swatch done of 61 and gosh. Kira - Ahh Flakies, love them too. We are so luckey to have so many awesome polish finishes to choose from now days. My Nanna would go nuts for this stuff if she were around today. Jaztee - I thought duochrome would be higher too, especially higher than a cream finish. Maybe its just me who thinks creams are a bit boring. I love shimmers, I can't believe it only pulled 4% of the votes! I haven't had a chance to try any holo polish yet so I haven't seen their magic in real life but I'm sure that I'd love it probably just as much as my shimmers. I'm finding really interesting reading everyone's answers! Thank you so much for publishing it! Of course my choice is also holos and glitters! Is there such as thing as too much layering? Gosh vs Nfu Oh 61 - Who wins the holodown? GOSH, is it really worth all the hype?